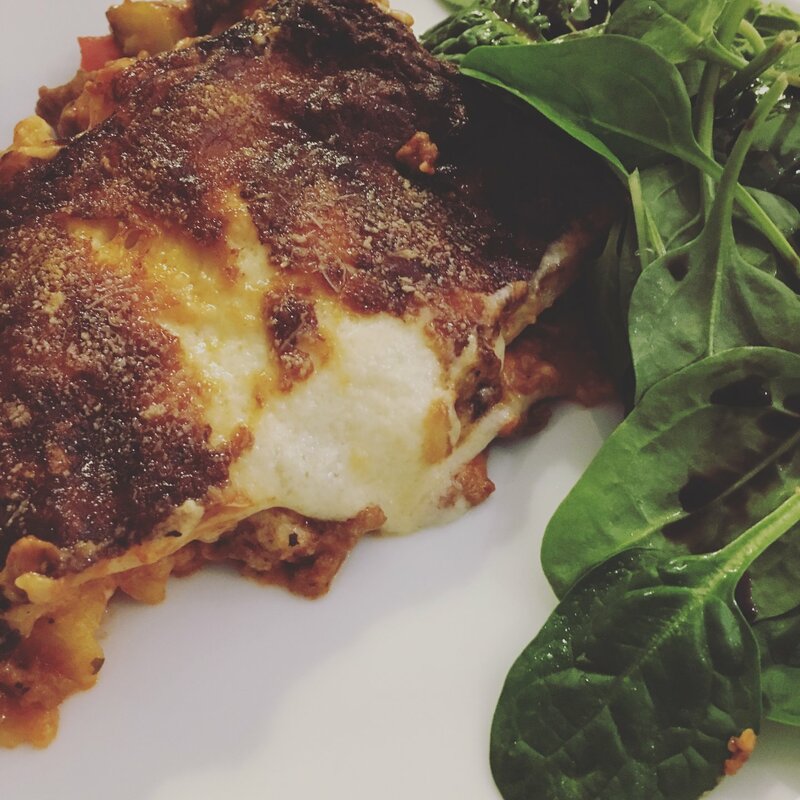 After posting my gluten free fish pie recipe last week, and sharing this rather embarrassing lasagne-related anecdote, I thought I’d share my gluten free lasagne recipe with you guys today. This always goes down a treat! Preheat oven to 190C (I have a fan, adjust this accordingly!). Fry the onion in a little oil until golden, before stirring in the mince. At this point I add a generous shake of dried oregano, followed by another of basil. Stir it all around until the mince in browned. Now add the pepper, give it a chance to soften a little before adding the courgette and mushrooms, and the passata. Leave it it simmer while you make the sauce. For the sauce, take a separate pan and melt the butter. Then whisk in the flour and let it cook for a few moments. So go on and add all that cheese, then if you want you can season with a little salt and pepper (I try to avoid adding salt to my food so I usually just pop in a touch of pepper). Now turn off the heat under your sauce as you don’t want it to thicken any further. 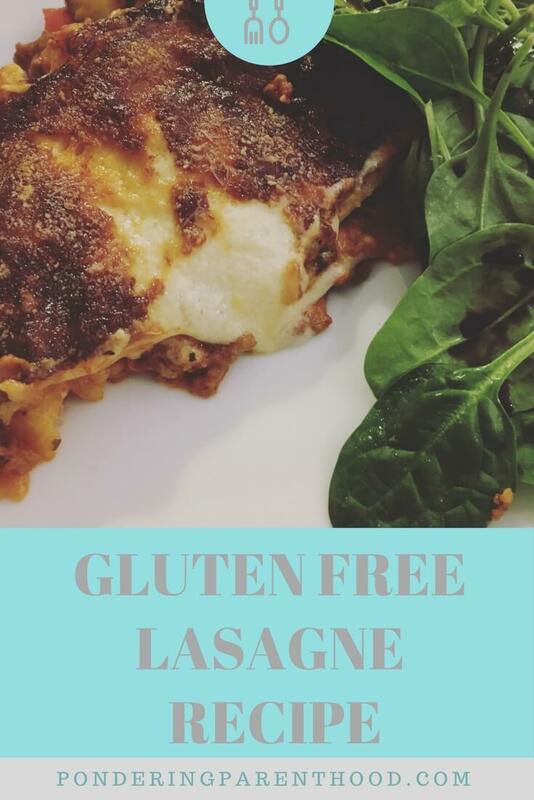 Follow the pack instructions for how to cook whatever type of gluten free lasagne sheets you’ve got. I use tesco free from lasagne sheets. They are a right pain! The only way I have figured out how to cook them without them sticking together is to fill my roasting tin half full with boiling water, and set it to boil over my biggest hob. I place 3 sheets at a time next to eachother into the boiling water and boil them for 3 minutes. I use 3 sheets of pasta per layer so this works out quite well. Ok, now it’s time to build the lasagne. First spoon one third of the bolognaise into the bottom of a large dish (my dish fits 3 lasagne sheets side by side perfectly, to give you an idea of size), then spoon one quarter of the cheese sauce on top (you’ll need to kind of spread it as you pour it off the spoon, don’t worry if there are gaps). Now use tongs to lift the lasagne sheets from the boiling water and lay them side by side on top of the cheese sauce layer. Repeat twice more with bolognaise, then cheese sauce, then lasagne sheets. Spread the remaining cheese sauce over the top layer of lasagne, then sprinkle an even layer of grated Parmesan over the top. When done, remove from oven and leave to stand for five minutes before serving. I serve mine with a generous handful of raw spinach leaves topped with a drizzle of balsamic vinegar. P.S. Always remember to put the dish on a tray before putting in the oven. I once had a food tech disaster at high school when my lasagne overflowed all over my friends apple pie on the shelf below. Sorry Abby! Fortunately she found it hilarious but lesson learned! "How often should you… *you know*?"